April is Month of the Young Child at San Mateo County Libraries! Join us in the celebration! Our 12 branches will have family-friendly activities and musical performances aimed to please and entertain the younger children in our homes. All month long we will dance, sing, and learn along with you as we welcome the Beetleladyopens a new window, Juan L. Sánchezopens a new window, GroovaRooopens a new window, Ballet with Erika, and Mr. Q! Look out for our Día de los Niños y Libros celebration when we will give away bilingual picture books and board books. For a complete listing of April programming at our branches this month, check out our events page. 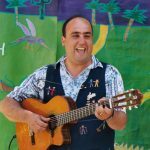 This interactive show will have children of all ages playing, dancing, clapping, giggling, and singing to Juan's catchy multilingual tunes. Bring your dancing shoes and your smiles! Visit our events page for a complete listing of Juan's concerts! Get ready to groove and move to Mister Q! 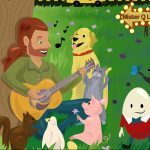 Mister Q's Toddler Dance Party is a fun and engaging music program with nursery rhymes, songs, stories, and jokes. Mister Q will be at the Woodside Library on Thursday, April 4 at 11:15 AM and the Pacifica Sharp Park Library on Saturday, April 6 at 11:00 AM. 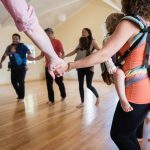 Open to parents and caregivers with babies from 3-18 months, the GroovaRoo pregnancy and babywearing dance classes are appropriate for all levels of dance experience! We'll be learning easy dances with an emphasis on creating a safe, sacred, and soulful dance experience for all. We welcome you to arrive in your own ergonomic, 2-shoulder carrier where baby can face in. Visit our events page for a complete listing of classes. Does your child love to twirl, play make-believe, and dress up? Then your child will love Erika's ballet class. Class begins by warming up our muscles, followed by practicing different ballet moves, and finally, we'll perform our dance routine. Have a budding entomologist at home? Then, join the Beetlelady as she teaches us about bugs, beetles, and spiders! 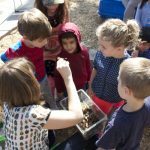 Visit our events page for a complete listing of Beetlelady preschool workshops. Do you have a creative child that cannot wait to unleash their imagination? Be sure to join us during our regular arts and crafts programs! We will wrap up the month with special activities and book giveaways in the final week of April in honor of Día de los Niños y Libros, a celebration honoring diverse children's books. Check out our Día events page for more information about special programs or activities happening near you!